First two checkboxes in the "Track settings" define where settings are taken. When these checkboxes are off used current settings for track. When first checkbox is on the settings for current track will be taken from previous track. Of course for first track this checkbox unavailable. Second checkbox allow taken settings from previous (by number) pattern. This checkbox unavailable for first pattern. Previous track, in turn, may also take the settings from another track. This way you can make common settings for all the tracks in the pattern, or even for tracks in all patterns. Hint: From previous track can be taken all settings except automation settings. Automation always set for current track. First and second track titles are used as information (memo) about track. If checkbox "Set track title" is on, this title will be set in pattern grid as track title and also will be used as name of track button in other modes (as example for drum pads). These titles are optional, but additional memo can make work more comfortable. The next few parameters define type of track. Each track can contain individual notes (each grid cell can contain individual note with pitch, velocity and gate time) or track can contain drum events. Drum events have a fixed trigger note that will be sent when event plays. Drum event haven't gate time, but can set start clock offset. Velocity for drum events can be defined as accent mark or as usual velocity value (see "Track events"). Hint: When you click "Test play" current trigger note will be sent in current selected output MIDI channel (one or few) on current MIDI device. For each track should be assigned one or some output MIDI channels. If channel not defined or set incorrectly MIDI messages will not get to destination. But don't assign all channels at once it's also wrong way. For more information on which channel you need to assign, see manual and settings of external music applications or devices. Field "Current MIDI device" shows device that will receive MIDI messages. This device can be defined automatically or selected from "MIDI devices" list. Hint: Click "Auto select" button to set automatically selecting device. 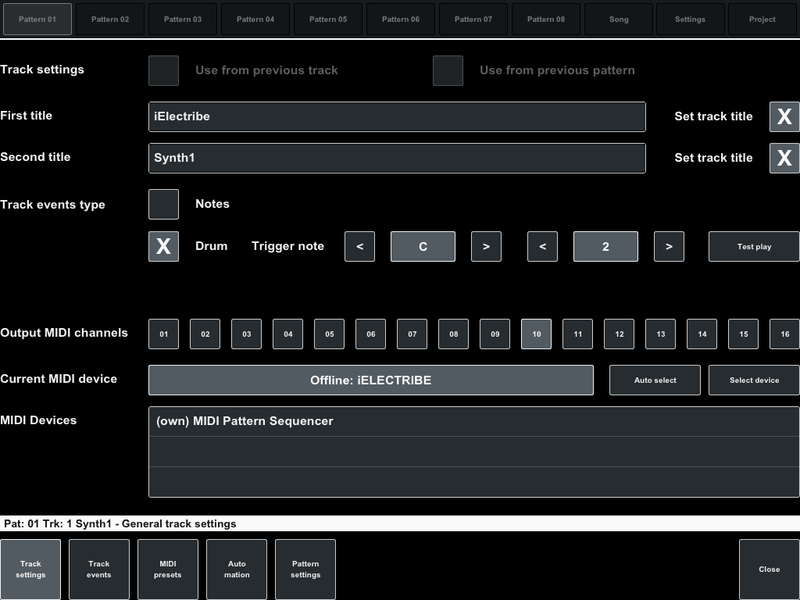 To set one of available output MIDI device from list select this device in list and click "Select device" button. In this case selected device will be assigned for this track constantly. If this device will not connected or application not running before the name of device would be "Offline" and track events will not play. 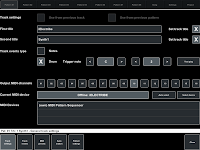 Hint: Own virtual MIDI device named "MIDI Pattern Sequencer" created for application that can receiving external MIDI messages but haven't virtual MIDI port. In most cases these application can receive messages from this device (as Garage Band for example).